The United States Tennis Association (USTA) and United States Davis Cup Captain Jim Courier today announced that world No. 11 Jack Sock, No. 14 Sam Querrey, No. 17 John Isner, No. 53 Ryan Harrison, and No. 54 Steve Johnson, will represent the U.S. in the 2018 Davis Cup by BNP Paribas World Group Quarterfinal against Belgium. The best-of-five match series will be played on a hard court at Belmont University’s Curb Event Center in Nashville, Tenn., April 6-8. The Belgium team will be announced in the next week. Fans can purchase single-day tickets and three-day ticket packages at www.usta.com/daviscup. Volunteer information can also be found on this website. Play begins at 4 p.m. local time (5 p.m. ET) on Friday, April 6, and Saturday, April 7, and at 2 p.m. local time (3 p.m. ET) on Sunday, April 8. Friday will include two singles matches featuring each country’s No. 1 player against the other country’s No. 2 player. Saturday’s schedule features the doubles match, and the final day of play on Sunday features the two “reverse singles” matches, in which the No. 1 players square off, followed by the final match between the No. 2 players. All matches are best-of-five sets until one nation clinches the tie. Sunday will feature a revised schedule if a team clinches in the third or fourth match. Tennis Channel will provide live daily coverage. The winner of this tie advances to the World Group Semifinal, Sept. 14-16, where it will face either Croatia or Kazakhstan. Should the U.S. win, the team will be making its first Davis Cup Semifinal appearance since 2012. The USTA has partnered with Belmont University, the Nashville Sports Council, and the Nashville Convention and Visitors Corporation to bring this event to the city. Local tie sponsors include Enterprise Solutions, Wyatt Johnson Automotive Group, and PepsiCo. The U.S. holds a 4-0 record over Belgium in Davis Cup play. The U.S. last faced Belgium in the 2005 World Group Playoff in Leuven, Belgium. The U.S. won the tie, 4-1, with a team led by Andy Roddick, James Blake, and Bob and Mike Bryan. The U.S. also squared off against Belgium in the 1998 World Group Quarterfinal in Indianapolis, as well as in 1953 and 1957. #TeamUSATennis Captain Jim Courier just announced the 2018 @DavisCup Quarterfinals Team! They'll be taking on Belgium in the Curb Event Center on April 6-8! Sock, 25, is currently the top-ranked American man, at No. 11. He ended his 2017 season by winning his first ATP Masters 1000 title, in Paris. That win was one of his three ATP titles last year (Auckland, Delray Beach). He also reached the semifinals of the ATP Finals in London. Sock has played Davis Cup since 2015 and holds a 4-3 record in singles and a 2-0 record in doubles. Also a doubles specialist, Sock was the 2014 Wimbledon men’s doubles champion and a two-time medalist at the 2016 Rio Olympics – capturing bronze in men’s doubles, with Steve Johnson, and gold in mixed doubles, with Bethanie Mattek-Sands. Sock captured his 10th career ATP doubles title with Davis Cup teammate Isner in Indian Wells this past weekend. Querrey, 30, is ranked No. 14 in the world. He reached a career-high No. 11 in the world this February after reaching the final of the New York Open. In addition, he advanced to the quarterfinals of Indian Wells last week. Querrey also had a strong 2017 season, reaching the Wimbledon semifinals – the first American men’s Grand Slam semifinalist since Andy Roddick (2009 Wimbledon) – and the quarterfinals of the US Open. He also won his ninth and 10th career ATP singles titles last year (Los Cabos, Acapulco) and recorded victories over Andy Murray, Rafael Nadal, and David Goffin. Querrey is competing in his fourth consecutive Davis Cup tie and his 13th overall. He made his Davis Cup debut in 2008, where he faced Nadal in his first-ever Davis Cup match. Querrey holds an 8-9 record in Davis Cup singles play and is 1-0 in doubles. He also competed in the 2008 Olympic Games in Beijing. In addition to his singles success, Querrey holds five ATP doubles titles, including two with Isner (2010 Memphis and 2011 Rome) and one with Johnson (2016 Geneva). Isner, 32, is ranked No. 17 in the current world rankings and will be competing in his 16th Davis Cup tie. He is 14-11 in singles and 2-0 and doubles. Isner made his Davis Cup debut in the 2010 World Group First Round in Belgrade, Serbia, where he became the first U.S. player since 2003 to compete in three live rubbers in the same tie. Isner won his 11th and 12th career ATP titles in 2017 (Atlanta, Newport) and advanced to three ATP Masters 1000 semifinals. Isner’s biggest Davis Cup victory came in 2012, when he defeated Roger Federer in the U.S. team’s first-round win at Switzerland. He also represented the U.S. at the 2012 London Olympics, reaching the quarterfinals before losing to Federer. In doubles, Isner captured his fifth career ATP doubles title with Davis Cup teammate Sock in Indian Wells this past weekend. Isner turned pro after an outstanding four-year career at the University of Georgia, leading the Bulldogs to the 2007 NCAA team title as a senior. Harrison, 25, is ranked No. 53 in the world, and is nominated to play in his fourth Davis Cup tie for the U.S. and second this year after winning the clinching doubles point in February in Serbia. Harrison is coming off a 2017 season in which he won his first Grand Slam doubles title, at the French Open (with Michael Venus), and his first ATP singles title, in Memphis. Harrison also reached the final in Atlanta last summer, losing to Isner, and started his 2018 season with a run to the singles final in Brisbane, Australia. He played in two Davis Cup ties in 2012, going 1-2 in singles and falling to France’s Jo-Wilfried Tsonga in the Quarterfinal round, his only live singles rubber. Johnson, 28, is ranked No. 54 in the world. He is playing in his fourth consecutive Davis Cup tie and fifth overall, after a 2017 that saw he and Jack Sock – the 2016 Olympic Bronze Medalists in men’s doubles – win both of their Davis Cup doubles matches, vs. Switzerland and Australia. Johnson and Ryan Harrison clinched the first-round tie for this U.S. this year in Serbia. Johnson won his second career ATP title last year, at the red-clay event in Houston, and he reached nine ATP quarterfinals in 2017. Johnson, who reached a career-high ranking of No. 21 in the world in July 2016, turned pro in 2012 after an outstanding college tennis career at USC; he won the 2011 and 2012 NCAA singles championships and led the Trojans to team titles all four years he played for the school. Belmont University alumnus and Nashville native Brian Baker, 32, will also be accompanying the U.S. Davis Cup Team for the week. Baker will serve as an “unofficial coach” to assist the team in practice and will then be a sideline reporter for Tennis Channel during its broadcast. Baker, 32, peaked at a career-high of No. 52 in the world in singles in October 2012 and No. 29 in the world in doubles in May 2017. He was also a member of the 2016 U.S. Olympic Team in Rio. While recovering from injuries and surgeries throughout his career, Baker studied and coached tennis at Belmont, graduating with a business administration degree in May 2015. Founded in 1900, Davis Cup by BNP Paribas is the World Cup of Tennis and is the largest annual international team competition in sport, with approximately 135 nations competing each year. The U.S. leads all nations with 32 Davis Cup titles. The U.S. holds a 218-71 all-time Davis Cup record, and owns the longest uninterrupted run in the World Group, dating back to 1989. For more information, including access to player and historical Davis Cup records, please go to www.usta.com/daviscup or www.daviscup.com. Follow Team USA using hashtag #TeamUSATennis on Facebook @USTA, on Twitter @USTA and on Instagram @USTA. Wilson is the official ball of the U.S. Davis Cup team. 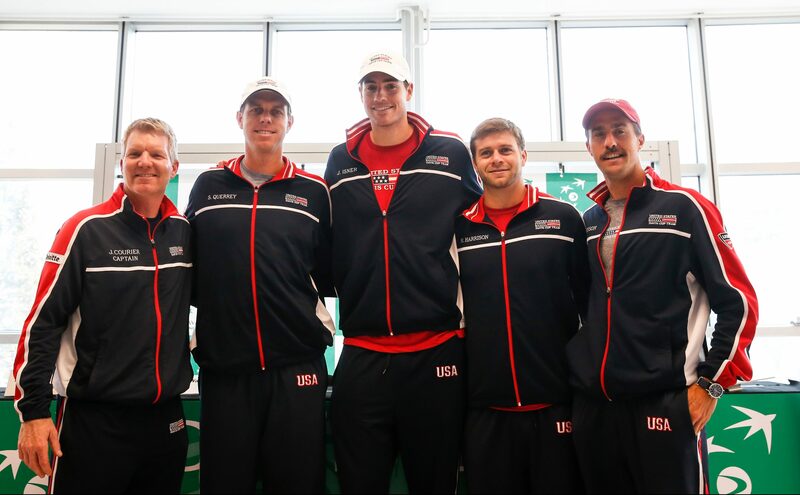 Deloitte is the official team sponsor of the U.S. Davis Cup Team.